The GPA Calculator requires a spreadsheet program. The file has place for two different grade scales and both may be edited to match your grade scale. The calculator will return the GPA, QP, letter grades, and total credits. 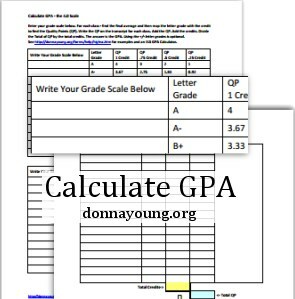 Worksheet that may be used to calculate GPA using the 4.0 Scale. Each file is the same, only the format is different - PDF, DOC, and DOCX. Below are two quality point tables. The tables are set up for two particular grade scales and shown for an example only. With the tables you can determine the quality points to enter for each class. Both tables are based on the standard 4.0 GPA scale. Below are two tables each one shows the quality points earned for each credit value and grade. The next table is detailed in that it includes the +/- grades. Below is a sample transcript entry. The green part is the part of interest; it is the part that contains the information that allows one to compute GPA. The answer will be the GPA. For example, Geography will earn 1 credit. The student's final letter grade is B+. Using the grading scale above, the quality points (QP) for a 1 credit course that earned a grade of B+ is 3.33. PE is a 0.5 credit course. The letter grade of A earned for a 0.5 credit course gives a GPA of 2.00. At the end of the year add the credits earned. Find the quality points (QP) for each grade/credit. Add the QP and divide the sum with the number of credits earned. In the example above, the green column shows the QP's that were earned for each course. The QP's are added and they total 21.33. To get the cumulative GPA, divide the total (21.33 in the example) by the number of credits that were earned (6 in the example). This yields a GPA (grade point average) of 3.5. Grade scales vary and below are three examples. Notice the score range of the letter grade D; it is in the 60's in two of the grades scales and in the 70's in one of the grade scales.